The makers of SkySails have chosen Hatteland Display to supply marine displays and computers for the control system of this innovative wind propulsion system for ships, which actually uses large towing kites to reduce fuel costs and emissions. And with the focus currently on shipping's environmental impact, SkySails is set to be big news in the coming years. Ship design is one of the biggest factors in fuel efficiency but there are tens of thousands of vessels out there already in service, so the industry is now looking at innovative ways to address the rising cost of fuel and to reduce emissions for existing vessels. Many such systems are being developed, from engine performance monitoring to sophisticated ballast solutions, but there's no doubt that SkySails stands out as the most exciting concept. It is a proven system too. Depending on the prevailing wind condition a ship's annual fuel bill can be cut by 10 - 35% by using the SkySails system. Hatteland Display fits into the SkySails picture as the provider of displays and computers for the sophisticated control system. We all know that flying a kite is easy, but to fly a kite the size of SkySails requires a powerful control system with the best quality, most reliable displays and computers available. The ship's crew can operate the SkySails system from the bridge. The SkySails automatic control system performs the tasks of steering the towing kite and adjusting its flight path, so in order to provide the maximum fuel efficiency, the computer must be able to reliably handle the complex software and multitude of external sensors that make it all happen. 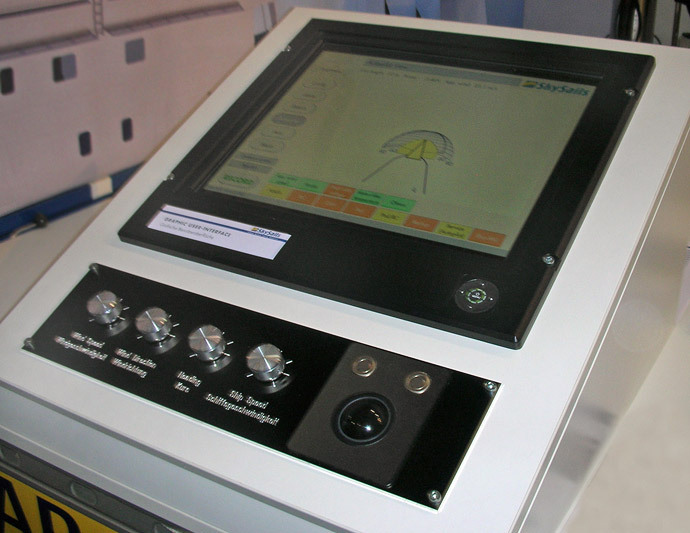 All information on the operation status of the system is displayed in real-time on the monitor of the SkySails control panel and must be easily accessible for the crew at all times. 19" Series 1 MMDs (redesign) were chosen for this job as they are the most proven marine bridge displays in the market. Mario Haake, a Sales Engineer based in Hatteland Display's German office has led the work with SkySails: "SkySails is an exciting project for us as it is technically challenging and very much in the public eye right now. Their requirements for the control system computers and displays are very high, but the Hatteland Display reputation of quality and reliability ensures confidence in the equipment that we will supply." SkySails is already onboard several cargo vessels and German shipping company 'Wessels' order three more systems in July 2008. With green shipping becoming more and more necessary for the industry, these will just be the first of many SkySails systems helping to cut costs for the operators and to cut emissions for the whole world.